American Title Resources, Inc. recently moved into the building at 600 South Broadway in Greenville, the corner of Broadway and Fifth (in the building formerly occupied by Treaty Travel). A full exterior makeover is underway, with the building being painted a trendy sage color - which does not entirely come through in the photographs. The most striking feature, though, is the detail work, which likely resemebles the building's original look in 1887. 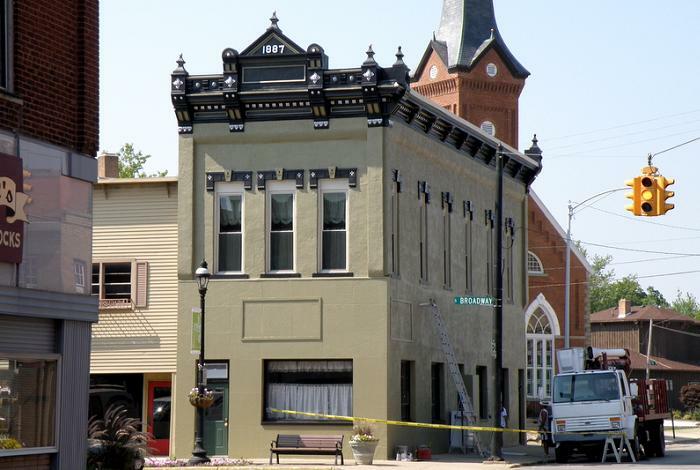 There are so many great old buildings downtown and it's nice to see one restored in such detail. It was the trend for a while in many communities that the entire exterior was painted one color. Fortunately this seems to ended as building owners bring back out the historic detail instead of masking it. Absolutely beautiful! Congratulations American Title Resources, Inc. for respecting the integrity of this dignified old building. I wish every building on Broadway would follow this and Broadway Joe's example! That is wonderful. Thank you for keeping the downtown looking historical and beautiful. This building looks so nice that I am not even sure Greenville deserves it! Great job and wonderful appealing colors. Is this an example of the professional work that Countryside Painting is capable of? They deserve some recognition here, also. It does look really nice ... kudos to all involved. It can be almost amazing what a few coats of paint can do for a building. Hopefully some other building owners on Broadway will follow American Title's lead.